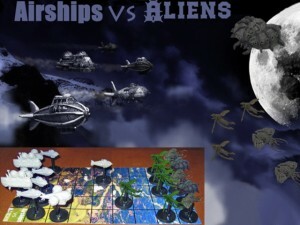 Airships vs. Aliens, from ZN Games and Impact Miniatures, has added a new game system to their Airships vs. Aliens miniatures Kickstarter. What would you rather do, defend the Earth or invade it? Airships vs Aliens is a quick strategy board game for 2 players with one player defending the Earth with 10 Steampunk Airship miniatures while the opposing player attempts to win the invasion using 10 Alien ship miniatures. The game is pure strategy with no luck elements involved. Airships vs Aliens has an easy to learn with just 2 pages of rules for gameplay but includes more complex strategies due to the use of limited command tokens offering an extra move during a single turn and possible reinforcements of previous destroyed ships. Rules for the game can be found at the KickStarter.